Rather than find some superficial tie-in for Halloween, I'd like to give a nod to an authentic one being promoted by author Neil Gaiman. It was an idea he had back in 2010. It was simple, straightforward. 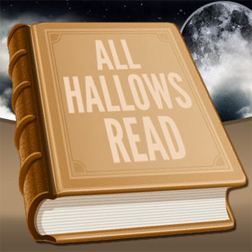 Instead of filling sacks with sweets and other treats (although you can do that too), why not be part of All Hallow's Read and give someone or everyone a spooky book for Halloween. It doesn't have to be today. Make it sometime this week. Not only would such a gift be memorable, but it's a hit for literacy. If you think a book might be too much to give, there are always comics instead. The point is that a book is safer than candy and it lasts that much longer. Who knows? Maybe it will last an entire lifetime. The pitch for All Hallow's Read by Neil Gaiman. Let me be clear. This brilliant idea wasn't my own. It belongs to Gaiman and I was fortunate enough to learn about it as a fringe benefit to publishing an alternative review site call Liquid [Hip]. We do more than review the occasional author or artist. We listen to them long after they make the list. Not only has Gaiman put together a website to promote the idea, but he also published this video to explain. Five titles that are great fun for Halloween. Hobgoblin by John Coyne. Although meant for young readers, it is also one of Coyne's best before joining the Peace Corps. It's about prep school student Scott Gardiner whose love of fantasy role playing begins to blur with the real world. Despite some story problems, it's well worth the read. It mostly holds a special place for me because I stumbled upon the book as a young teen while traveling alone. My flight was late on arrival, stranding me without any cash in Dallas. I couldn't convince the store clerk to give it to me on loan so I read as much as I could in the airport bookstore. It took months to track it down again because I had forgotten the author's name and Hobgoblin was so ubiquitous. The Stand by Stephen King. The Stand is easily one of the heaviest horror books ever written. There are plenty of people who love it and hate it. But as far as end-of-the-world scenarios go, it's hard not to appreciate a mutating flu virus that paves the way for an apocalyptic confrontation. As King was one of my favorite authors for many years, I had to include him. The Stand is my favorite, even if King had written other stories that were more frightening (It) and sometimes more disturbing (Survivor Type in Skeleton Crew). Ironically, I've only reviewed one of his books on Liquid [Hip]; a collection of short stories called Just After Sunset. Heart-Shaped Box by Joe Hill. Although I have yet to read Horns, Heart-Shaped Box was an amazing debut about an aging death-metal frontman who decides to buy a ghost on the Internet. Mostly, he bought it because he wanted to believe he didn't believe in the supernatural or his former persona. Besides being a great book that I had the privilege to review, I had no idea that Hill was also Stephen King's son until I finished the book (although it was obvious there were King influences). While it gets a little wonky at the end, it was great to find someone focused more on the supernatural and less on hack-and-slash horror. Summer of Night by Dan Simmons. Although many people know Simmons for his science fiction and fantasy, he wrote one of the most riveting horror stories I've ever read. It's about five 12-year-old boys who would have been content to come of age riding bikes in their small town of Elm Haven, Illinois. Unfortunately for them, there is an old evil that is coming to life again under their quiet town. Although I don't know if it would hold true today, I remember this book as the scariest I had ever read. In fact, it was the only book that once kept me up at night because the idea of going to sleep with the story still in my head was too much. It didn't help that the same night I was reading it, my apartment door (which I believed to be locked) blew open with such force that I thought someone was breaking in. While it does resemble an outline, it might be the better book. Midnight by Dean Koontz. While Odd Thomas is probably his most memorable character, Midnight was one of his most memorable books. The transformation of the people who live in Moonlight Cove, Calif. — whether surrendering to their wildest urges or becoming affiliated with computer-enhanced intellectualism — is frequently nerve-wrenching with its frenzied pace and genre-bending bite. While Koontz is likely too popular for review on my alternative site, Midnight will remain one of my favorites from this well-known author. The idea of chemically induced evolution is perhaps even more relevant today as what was once science fiction now resembles science fact. There are countless more I could list. Several of them can be found on my growing online bookshelf, including one by Gaiman with co-writer Terry Pratchett. (One for now, I am certain). If you want to grab up something short, look for Roald Dahl or Rudyard Kipling. All of these gems can be considered lovely stuff. So I hope you will consider Gaiman's idea seriously. If not this year, the maybe next. Special note to Neil Gaiman: Anytime you want to talk about creating an online campaign to support All Hallow's Read, do not hesitate to drop me a "note". While it already has strong grassroots support, a little push in the right direction would give a groundswell to make it permanent. Changing Conversations: Can We End Partisanship?